Trailhead Technology Partners is a Michigan, US-based provider of custom software solutions. The company develops a variety of Web, cloud, mobile and IoT applications and caters to clients in the Real Estate, Engineering, Food Distribution and other business domains and niches. 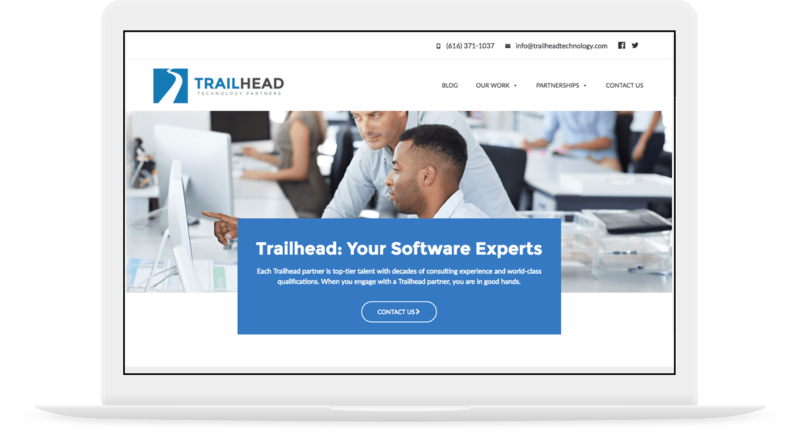 Trailhead Technology Partners is a Michigan-based and industry veterans-led software development consultancy, whose founders’ experience dates back to when the IT industry just came into being. They had been our executive team's business associates long before becoming Vilmate's client and partner back in 2015. The company is engaged in rendering consultancy and project-based custom software development to an array of clients in the Civil Engineering, Food Distribution, eCommerce, Real Estate and other verticals and business domains. As technologists, we greatly value our relationship with Trailhead Technology Partners as consummately knowledgeably partner, pride ourselves on having been able to live up to their invariably high-quality standards and do our best to expand our cooperation. Over the several years, we have been partnered with TTP, we have jointly implemented over a dozen projects. They have, on many occasions, approached us to augment their project teams. Our partnership with TTP has proven to be a highly efficient alliance not only due to the great rapport we have always had with them. In addition, it is also distinctive of a powerful technology synergy that was created as a result of TTP’s range of competences being enhanced with Vilmate’s Front-end and mobile development expertise. A 3D-driven comprehensive retail solution that comprises a Web-based Administration module, a Web-based Consumer portal, and a touch-screen desktop application, coupled with a 3D projector. Part of the solution is installed in brick-and-mortar stores and is used to show a 3D model of a product as a hologram. The solution allows managing a POS network and supports a complex user hierarchy, which, in particular, includes Brand Administrators and Store Managers. Technologies: .NET Core, UWP (Universal Windows Platform), Angular 4, Microsoft Hololens, Azure B2C. An AI/Big Data-driven Marketing & CRM solution, intended to automate a real estate agency’s interactions with their customers and business associates. The solution enables realtors to communicate with their clientele and prospects a great deal more efficiently and via a single point of access. Technologies: AngularJS 1.5, Entity Framework, HTML5/CSS3. A Web-based project and document management system, intended to automate the document-related workflows of a strong regional construction company, engaged in a variety of building projects. The system allows the user to promptly locate a project file, see a list of the documents it contains and conveniently looks up the basic data on the project.